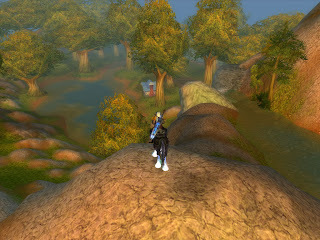 ECTmmo.com- MMO Blog: The Adventures of Kaozz...: Do you really have to be 'gaining' something in a game to have fun? Do you really have to be 'gaining' something in a game to have fun? My buddy Pouncealot from Heals and Dots replied to my last post with a post of her own. My question was, "How do you take a break from high end?" Her reply made me nostalgic, as she's been exploring old world. She is one who isn't shy about doing as she pleases, which is refreshing. While most people will run heroics or raid until their eyes bleed (Myself included! ), not too many people like to just explore or revisit old world. They hang out in Dalaran until they feel like they are burnt out. "Oh I quit WoW again.. nothing to do." Do you really have to be 'gaining' something in a game to have fun? Sometimes my husband will duel people for large amounts of time. I use to think that he was wasting time, but he was learning about his class and other classes all the while having fun. I like to roam around and do old instances sometimes. Lately we've been playing a lot of alts. Some of them may not make it to 80, I am sure we have a new duo headed there soon. We are having fun, no matter what we play. He decided to dust off his 64 Mage last night and we had a nice time. Dire showed me a good spec and rotation for my Death Knight, he is far more melee oriented than I, probably an all around better player when it comes to melee. He's good at anything he plays, I sometimes envy him, he makes everything he plays look so much fun. He is a big key binder. We stood in SW beating and nuking the hell out of the dummies for awhile to see how our dps was, patting each other on the back. It was nice. Did we get anything done in game by doing so? No, but we learned about our specs some, trying different ones out seeing what fit with our play styles. We had fun. We also quested, which he is more of a drill sergeant on the leveling field sometimes! I don't know how well the Death Knight and Mage combo will go. I may try to work on my Shaman with the Mage. I have one more spec to try out on the Death Knight before I decide.It doesn't matter what I decide to play, all that matters is that I am having fun. I already have my 80's I can play anytime I want high end. Live a little, have some fun! Yeah I'm the same way in game as I am in the real world. "Marching to the beat of a different drummer' is a phase that has been said about me, A LOT. I have so much doing things that most people don't do once they hit end-game. I try to have that fun while leveling too. I believe it's nice to mix things up a bit so you don't get burned out. I definitely apply that in-game and in the real world too. Me too. While I love to engage in leveling and getting gear upgrades, I still like to stop and smell the flowers. My hunter is currently parked in Winterspring doing the faction quest for the mount.. I should level her but I really want to do that faction hehe.